Sunday's protest at Opua attracted around 60 people and their four-legged friends. 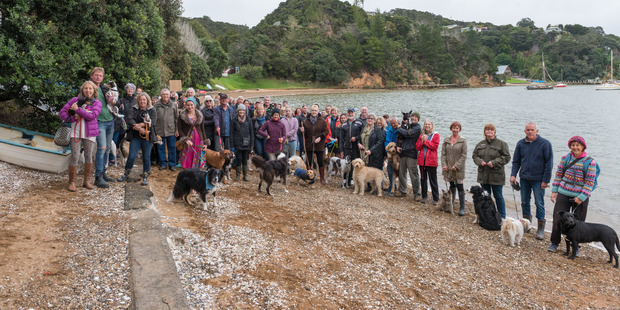 Gloomy weather did not deter 60-odd dog owners from congregating at Opua Beach with their four-legged companions on Sunday, in protest over the Far North District Council's proposed dog control bylaw. They included Dr Ian Hoffer and his wife Asa, who were relaxing on a beach in the Greek Isles when they received news from home that dogs would either be prohibited or confined to a leash on their local beaches for six months every year. "We were so upset to hear that the enjoyment of meeting with other people and letting our dogs play in the sand together, which has been a daily routine for us for 13 years, is about to come to an end," Mrs Hoffer said. After 26 continuous hours' travel the coupleskipped a refreshment stop in Auckland and dashed home to join Sunday's rally with their puppy Angus. Angus showed no sign of becoming an environmental threat when he turned up at Opua Beach with owner Asa Hoffer on Sunday. Retired Kerikeri couple George and Audrey Adams were there with Lass and Peggy to show their concern over what they regard as short-sighted regulations. Most dogs were very energetic and needed daily off-lead exercise, they said. If the council enforced its proposed bylaws they, and many others, would have to drive some distance to find a permitted dog exercise area, potentially twice a day. There were only two off-leash areas for Kerikeri, one on Wiroa Road. "It's just a paddock behind the crematorium that sometimes has cows grazing in it." The other is "way down" Inlet Road (Roland's Wood). 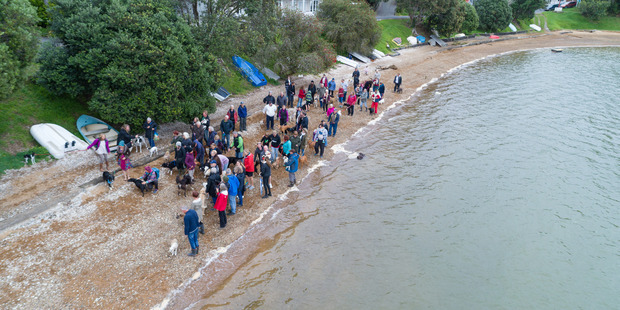 Kaye Vezey, who co-organised the rally, in conjunction with Bay of Islands Watchdog, said the 'olive branch' offering of Opua Beach as a day-long, year-round exercise area did not compensate for the off-leash opportunities the council had simultaneously deprived dogs and owners of. About 60 dogs and their owners gathered on Opua Beach in protest at a proposed new bylaw banning dogs from the beach. The current bylaws permitted off-leash, but under control dogs in public places and on beaches during the morning and evening throughout the year. Now reserves and urban areas were to be on-leash all year, and beaches would be dog-prohibited or on-leash for six months of the year. Urban folk wanting to have more than two pet dogs would no longer be able to apply for a permit to do so, while in future Russell residents may not be allowed any dogs at all if the conservation ideals for the town came to pass. "The bylaw and policy draft, approved by the community boards in June, ignore their responsibility under the Dog Control Act 1996 to adopt a policy that provides for the exercise and recreational needs of dogs and their owners," Ms Vezey said. "Last year councillors rescinded their intention to ban dogs on the Twin Coast Cycle Trail, allowing so many dog owners between Opua and Horeke the chance to share the enjoyment of the fabulous community amenity alongside cyclists and walkers," she said. "The social benefits of a dog-inclusive culture far outweigh the negative aspects that are so often disproportionately represented."